Just a few months ago, Mayada and her family had never heard of Chicago. Today, they call the city home. On January 13, 2015, RefugeeOne welcomed Mayada and her family at O’Hare. 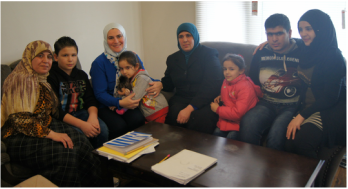 They were among the first Syrian refugee families to be resettled in the U.S. Mayada and her children, along with her brother and his wife, lived in Syria in 2011 when the government brutally cracked down on the non-violent civilian uprising. Violence became an everyday occurrence. Mayada's husband was killed on his way home from work, and to this day, the family does not know why. Many of her relatives and friends were put in prison, tortured, or killed. In 2013, when the family fled Syria, they left with only the clothes they were wearing because their neighborhood was being bombed. Two of Mayada’s daughters still have pieces of shrapnel in their bodies from that day. Since Syria’s bloody civil war began four years ago, 220,000 people have died. Nearly half of all Syrians have abandoned their homes and fled for their lives. The United Nations predicts the number of Syrian refugees could reach four million this year -- making this the worst refugee crisis since the Rwandan genocide twenty years ago. Along with thousands of others, Mayada and her family fled to Lebanon. But even in Lebanon, they were not safe. When refugee centers were attacked by Hezbollah, the extended family of nine rented a one-bedroom apartment to stay safe. While they waited for news of a permanent place to call home, Mayada’s children could not regularly attend school, and it was difficult for the adults to find jobs. When the family found out they would be resettled in the United States, they were excited and relieved to go to a safer country, but were nervous about cultural differences and language barriers. The family speaks Arabic but didn’t speak a word of English. RefugeeOne welcomed the family to their new home by greeting them at the airport, providing them with a furnished apartment, enrolling the adults in daily English classes at RefugeeOne, and registering the children for school. The agency also connected the family with an important friend and advocate-- Suzanne Akhras Sahloul. Suzanne, who emigrated from Syria to the U.S. with her family when she was ten, knows what it’s like to start a new life in the United States. She recently founded the Syrian Community Network, a mutual aid organization, to help make resettlement of Syrian refugees and immigrants as supportive as possible. Suzanne met Mayada and her family in January at RefugeeOne. “Their faces felt familiar to me,” she says. “I took an instant liking to them.” Suzanne now meets with the family in their home every week as their RefugeeOne mentor. She says it has been extremely rewarding to get to know them, help them adjust to new cultural norms, and connect them with the Syrian-American community. They remind her of special Syrian cultural traits – the warm affection between family members, the strong work ethic and entrepreneurial spirit, the pride in a well-kept home. As the U.S. State Department accelerates efforts to resettle Syrian refugees, RefugeeOne will welcome many more Syrians like Mayada and her family in the next year. 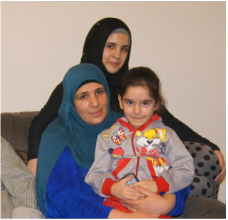 Today, Chicago is no longer a far-away, unknown city for Mayada and her family; it is their new home. Here, the family feels a sense of safety and is excited by the many new opportunities available to them.